The Volkswagen Haven is a concept that came up through the years of working on air cooled Volkswagens. As we learned more about our VWs we realized that antique German vehicles are a disease and the only cure is to keep acquiring them and working with them. This brought us to the idea that a haven for air cooled Volkswagens would be great. We are registered on A.I.R.S (see links) and have often helped friends with their VWs which is what the Haven is all about. Our shop has often been open to other air cooled VWs and one day there were actually seven lined up at our house being worked on by their various owners. Still regret not getting a picture of that. Currently the Volkswagen Haven consists of a house and a shop in the middle of suburbia in Calgary, Alberta, Canada. Still hoping that one day we'll get to starting the Baja ranch. With the cost of bandwidth and domain space coming down we have been able to give the Volkswagen Haven a web presence also. The first thing one notices about this web page is that it is simple. We are too busy with our Volkswagen habit to be messing about with fancy graphics and textures. My rule of thumb is that if I can't figure out how to get something to work right within 15 minutes, then I don't really need the feature. We will try to have content that makes up for the lack of glitter. The next thing a person notices about this site is that it's designed for high bandwidth. Most people have good connections these days. If you don't, my apologies to you. If you live out in the sticks, there's always satellite. Most images on our site are "clickable" for a larger view. There's nothing worse than someone bringing baby pictures to the office to show off. In this case if you don't want to see our family then you shouldn't have come to the Haven. We spend as many weekends as possible camping in the mountains. These are often in very remote spots which puts much different requirements on the types of vehicles, tools, and supplies required for such trips. The four wheeled family ranges from '56 to '71. In 2002 we added a newer member, to keep our oldies from dying too quickly in the winter. In 2008 we added another new member to the stable, as daily driving the Beetle has stopped being feasible. HaJa the Thunderbug - '67 Baja with '63 reduction setup from a bus and a balanced 1641cc engine. It goes quickly over the rough stuff. The Baja was off the road from summer 1999 until spring 2003. He drove around town a little bit & made one trip out to Waiporous (towed behind the UniMoG) before coming off the road again. We've discovered that the right rear torsion housing is cracked 1/2 of the way around. Next step, full roll cage. As of 2007, we have decided that the Baja will not make it back on the road at all. We have considered many options, but time constraints dictate that not *every* project we have considered can be completed. Sadly, there just isn't time to pursue all of our passions! The Magic Bus - '56 Bus, cargo version, we bought it as a basket case and it's lived up to it. Still it's a '56 in salvageable condition. It'll be on the road, one day. 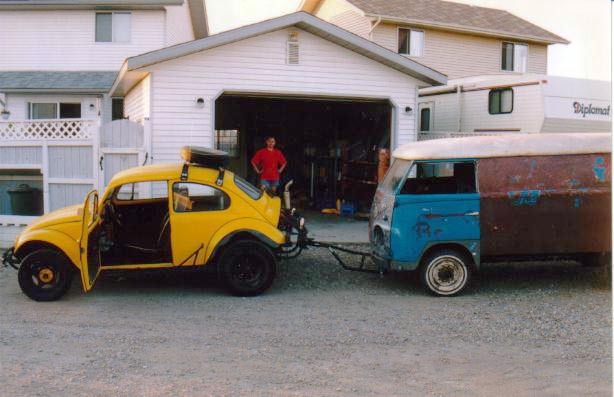 This is a picture of the Baja towing the '56 around the block to the front garage so that something else can come into the 'Magic Bus House' for repairs. Giggles/Snowball - '71 Beetle, Canadian custom, meaning it's a hodge podge from the factory including swing axles and less chrome than normal. Originally bought for the purposes of converting into an off road sedan, it's dual personality showed through and it wouldn't let us do it. With a 1776cc engine it was one heck of a sleeper. After a faulty valve-job by a formerly reputable VW shop in town ruined the engine, we decided to completely redo the body since we were building a new engine anyway. The progress of which can be seen in the gallery. Giggles got back on the road full-time again in 2002. As of the winter of 2007/08 the rust has taken over again and Giggles is stepping down as our second car. With the driver's side door pillar rusting out (the passenger's side pillar was replaced in the initial rebuild) we have decided not to rebuild the car again. It has been a fun time though! 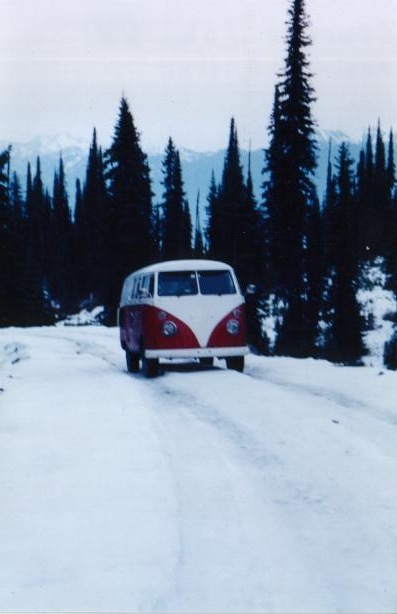 The Happy Bus- '65 microbus, cargo style with kombi doors and popout windows. The Happy bus just goes to show how VWs attract friends. This bus came along to keep our '56 company and provide the much desired transport of heavier items such as bricks and engines. 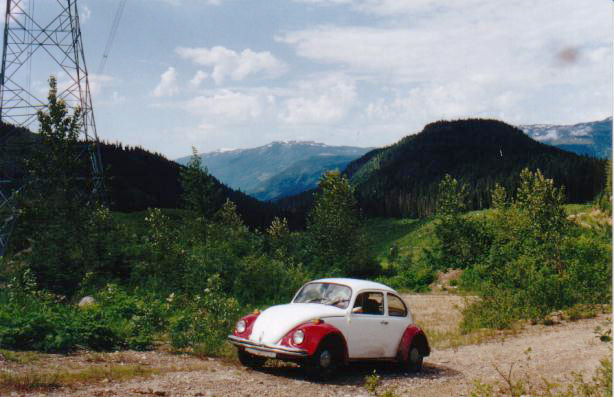 (Believe it or not, a VW engine can be carried in the passenger compartment of a Beetle, but not easily!) This bus found us about a month before the engine in Giggles died. This guy was our daily driver from 1999 to 2002. Seized link pins made him give his engine to Giggles so that some work can be done. In 2008, the Happy Bus passed to his next home. We hope that he will enjoy his *next* good life with his new owner. He had many good lives, as far as we can tell, we know we enjoyed our time with him. The Purple SUV Eater - '63 Mercedes-Benz UniMoG 404, ex-Swiss troop transport. We came across these remarkable vehicles at an industrial trade show and were so impressed that three years of researching them ensued. 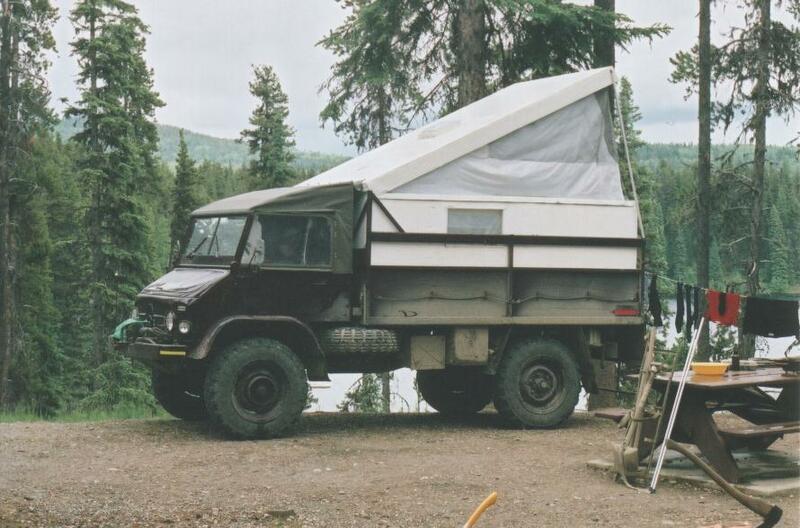 After that time, a cold, wet, muddy, stuck camping trip in the Bus in October convinced us that we needed a UniMoG. This should take much of the off-road abuse off of the Bus. The Bus is much more capable than people think but wasn't designed for the sort of abuse that the UniMoG was. The MOG has a personality much like a VW, and showed us his name by requesting the license plate SUVEATR. First the purple paint job, then the license plate! 2005 Kawasaki KLR650 - in 2006 we started adding motorcycles to the stable. 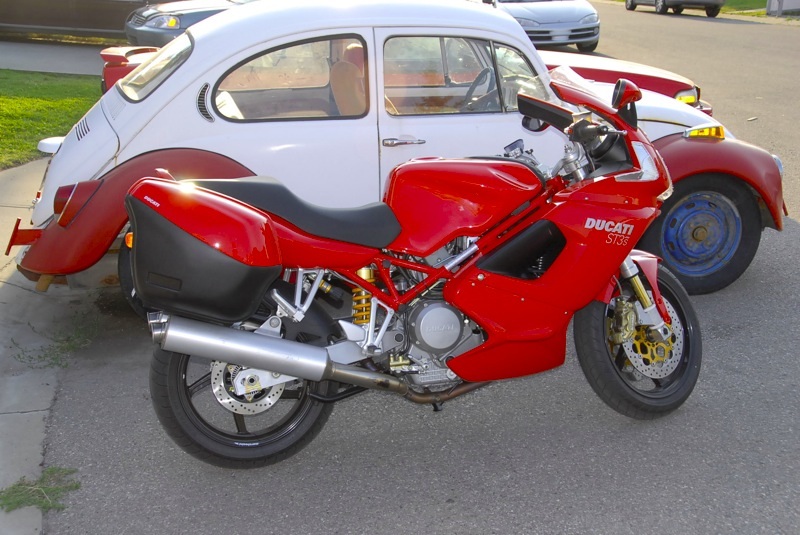 Initial research had us contemplating a pair of antique Ducati Condors, but the lack of availability of parts for the bikes, and the thought of riding 350cc's over the Rocky mountains led us to contemplate other bikes instead. 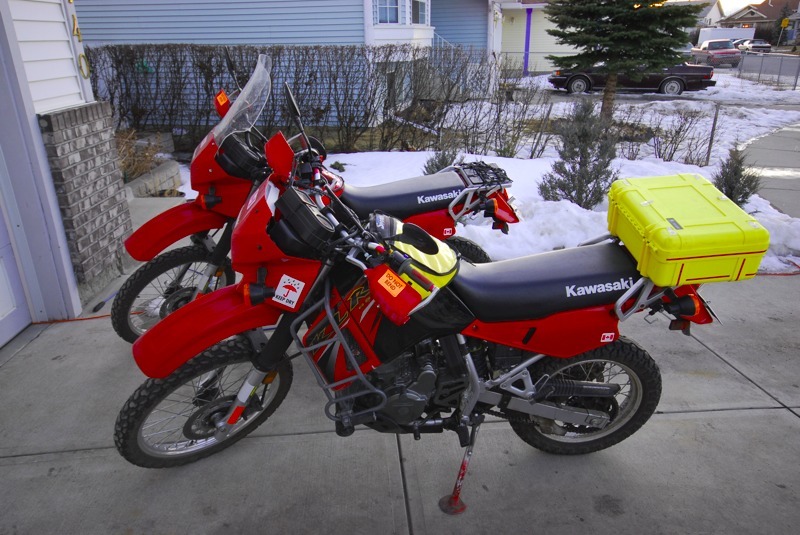 A pair of new Kawasaki KLR650's came home in March of 2006. 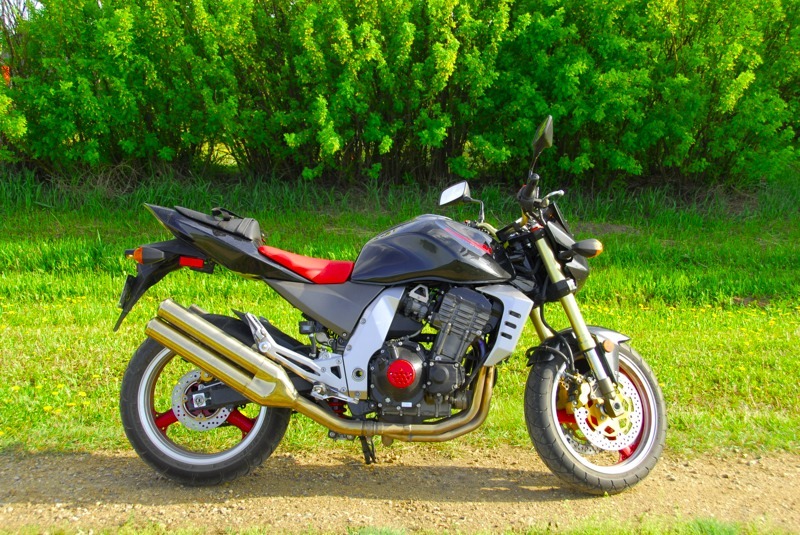 2003 Kawasaki Z1000 - At the end of August 2006 we came across a screaming deal on a 3 year old Z1000. 1300km on the odometer for 2/3 of new price was too good of a deal to pass up. Keith had been admiring the bike for a while, so he added this toy to the stable. 2002 Yamaha XT225 - Two weeks after finding the Z1000, we came across this XT with 170km on it. 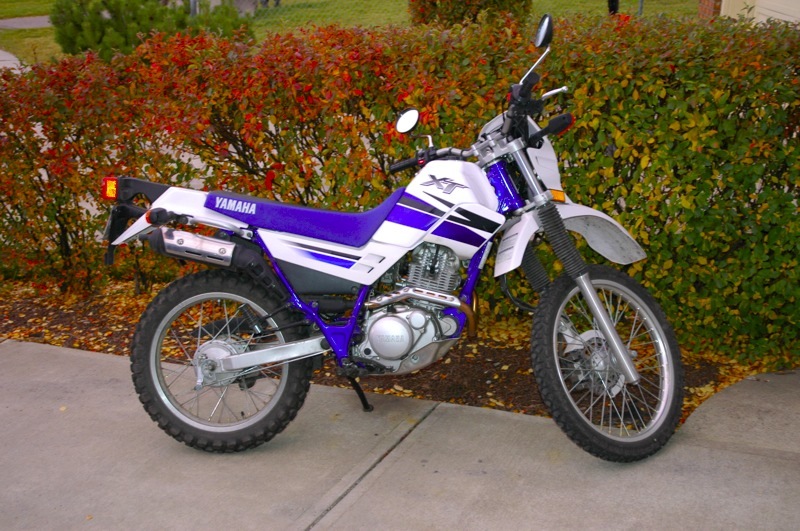 Sharon had discovered early in her KLR's life that it was *much* too big for her to use as a dirt bike, so this little bike was bought to help her learn off-road riding skills with a bike that she can pick up by herself when it falls over. 2007 Ducati ST3s - In August of 2007, Keith crashed the Z1000 on the track at Race City Speedway. He and the bike both fared extremely well, but this prompted the purchase of the sport-touring bike he'd been contemplating for 2008 occurring a bit sooner than planned. Prophetic, as the ST line has been discontinued for 2008 and he wouldn't likely have been able to get the bike the following spring!